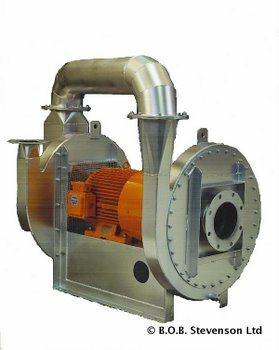 We fabricate centrifugal fans in mild & stainless steel from a diverse range of centrifugal fan designs suited to many varied & specialist applications specified by our clients. 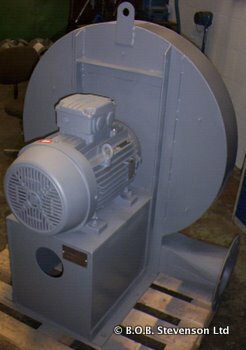 The William Alldays Alcosa RB is our general purpose industrial centrifugal fan with a radial bladed impeller designed to give medium flow rates at medium to high pressures. Impellers are available from 400mm to 760mm diameter and with up to eight blade widths to encompass flow rates up to 6,500 m3/hr at pressures up to 12.5 kPa from a single stage fan. The William Alldays Alcosa BI has a backward inclined impeller design to produce high volumes, up to 15,000 cfm at low to medium pressures, up to 15” w.g. 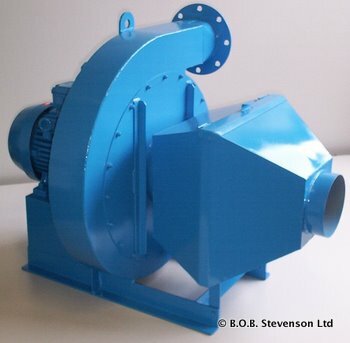 The Gordon Stevenson & Co ranges include heavy duty paddle bladed designs as well as induced draft fans plus blower and exhausters. The Apovent range which we manufacture under licence from Piller GmbH, in direct, coupling or belt drive arrangements, has a high efficiency backward curved impeller design which can achieve high flow rates up to 126,000 m3/hr at very high pressures of up to 20 kPa. Please contact our sales team on 01332 574 112 to discuss your requirements.